Now that The Passenger is well embarked with Tom Brown at the helm, brother Derek Brown’s internal cocktail laboratory – the bar-within-the-bar called the Columbia Room – is set to start classes in February. Seminars will be held every other Wednesday at 7pm for $65 each. The current line up through March sounds fascinating. It’s an ambitious program that will be helpful not only for you libation geeks already making your own bitters and eager to learn more, but also for those just delving into the world of craft cocktails. “A Primer on Orange Liqueur” kicks off February 17, covering the difference between major top-shelf makers and showing participants how to make your own version of triple sec. Derek will demonstrate proper Margarita, Sidecar and Fancy Gin cocktails and help elevate this sometimes over-abused ingredient. February 24 will cover the deceptively simple topic of dilution in “Ice, How to Use” while March 10 features my all-time favorite secret culinary ingredient with “Make Your Own Vermouth” (one guess what class I’m signing up for!). The quarter rounds out on March 24 as “Shaking versus Stirring” demystifies when to use one technique over the other. 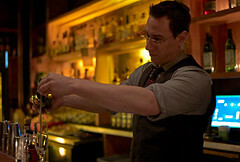 Register for classes by emailing events@passengerdc.com and get ready to improve your imbibing.